Engineered from the inside out, the 8.5 offers everything you have ever wanted in a wire; incredibly low resistance without electronic interference! In a single 12 inch length of Super Conductor Wire there is only 40 - 50 ohms of resistance! That is the lowest resistance of any helically wound wire. To accomplish this, we use a copper alloy conductor due to it's great voltage carrying capabilities. The low resistance results in less loss in spark energy so more reaches the spark plug. The conductor is wound extremely tight around a special center core. So tight in fact, that there is over 40 feet of conductor wrapped into a single foot of plug wire. This winding procedure, combined with a ferro-magnetic impregnated center core, produces an extremely effective Electro Magnetic Interference (EMI) "choke". This choke, or suppression capability, keeps the EMI inside the wire where it cannot interfere with other electronics on your vehicle. The outer sleeve that surrounds the conductor assembly is just as impressive. A proprietary blend of silicone and synthetic material produce a sleeve that is highly resistant to high heat as well as abrasion and tears. The MSD's 8.5mm spark plug terminals feature Dual Crimp terminals. As the name implies, the terminals feature two crimps; one for the sleeve of the wire and another separate crimp to grasp the conductor. 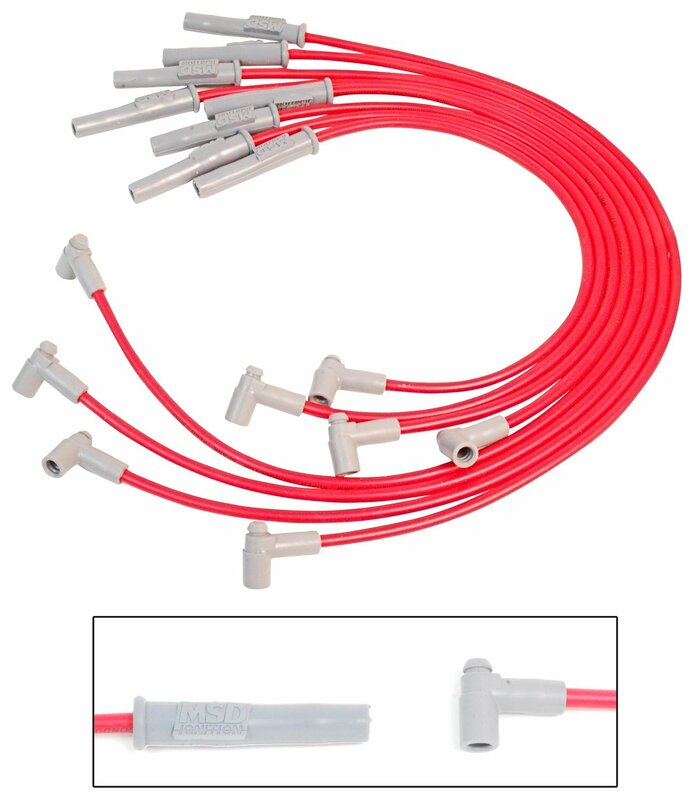 The MSD's 8.5mm spark plug terminals feature Dual Crimp terminals. As the name implies, the terminals feature two crimps; one for the sleeve of the wire and another separate crimp to grasp the conductor. Custom fit for make and model listed.